Would George Washington Make your Top 10 Americans List? I've been thinking of President's Day and of the qualities that make great leaders. Recently I read a list someone put together of the greatest 100 Americans, and I was wondering who should be in the top 10. I think Abraham Lincoln, Jane Addams, and probably Eleanor Roosevelt would be on my list, but then? Washington would probably make my list, too. I do have some questions about him, though-- as do some of the authors of the articles below. Here's an enlightening look at his first experience of command. There were two good results to that disaster: he survived, and he learned from it. I felt the key take-away message was that he did not repeat those mistakes, or have to surrender again. 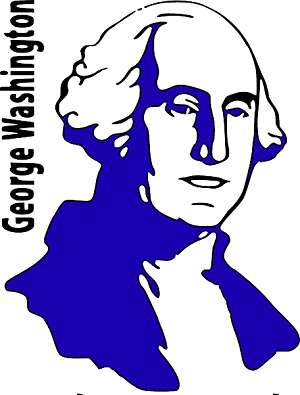 This Psychology Today article calls attention to five decisions that Washington made that show his courage, character, and wisdom. Washington was very conscious that the decisions he made as president would become precedents that would greatly influence the nation's future. He made those decisions not for his own comfort or gain (or even, in the case of #4, for his reputation) but for the future well-being of democracy in the U.S.
One of the choices praised in the last article was Washington's decision to free his slaves. Looking into the details makes it seem a little less noble, but also shows how difficult it was for the Founding Fathers to find a way to free the nation from slavery, even though many of them came to feel it was wrong. Washington did not free any of his slaves during his lifetime-- and his will asked for only one to be freed before his wife's death. However, his reasons were at least in part to spare his slaves from pain. Since Washington himself owned less than half the Mt. Vernon slaves, and many of "his" slaves had married others that were part of Martha's estate, Washington realized that there would be many difficult family separations. He chose to postpone the pain. His feelings about slavery were more and more negative, but he did not see a solution except for gradual changes in state law. He was concerned with avoiding conflict in the new nation so he did not actively speak out against those laws (and he DID actively try to recover a couple of his slaves that had escaped.) Mt. Vernon has collected a great deal of information on his changing views of slavery and on the fate of his slaves. As he was leaving the presidency, Washington summed up his hopes and fears for his country in a farewell address that still seems timely-- because his experience with politics and international relations made clear the dangers of partisanship and special interests. Washington argued it was also important to consider the good of the whole nation. He urged Americans not to separate into parties that only defended their own narrow ideas or goals. Most of all, he warned of the dangers of other nations using those partisan feelings to push for their own goals and possibly destroy the new nation. Check your understanding of some of the important vocabulary in these articles with this crossword. Its answers are here. Hope you have a great Presidents' Day!